Muscles are how we move and live. All movement in the body is controlled by muscles. Some muscles work without us thinking, like our heart beating, while other muscles are controlled by our thoughts and allow us to do stuff and move around. 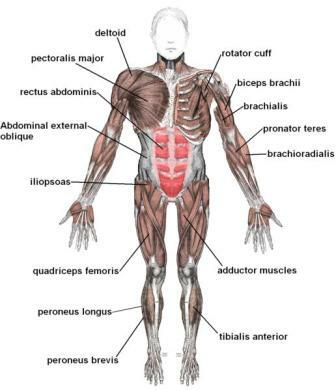 All of our muscles together make up the body's muscular system. There are over 650 muscles in the human body. They are under our skin and cover our bones. Muscles often work together to help us move. We don't really have to think about moving each individual muscle. For example, we just think of running and our body does the rest. Muscles work by expanding and contracting. Muscles have long, thin cells that are grouped into bundles. When a muscle fiber gets a signal from its nerve, proteins and chemicals release energy to either contract the muscle or relax it. When the muscle contracts, this pulls the bones it's connected to closer together. Many of our muscles come in pairs. An example of this is the biceps and triceps in our arms. When the biceps contract the triceps will relax, this allows our arm to bend. When we want to straighten our arm back out, the biceps will relax and the triceps will contract. 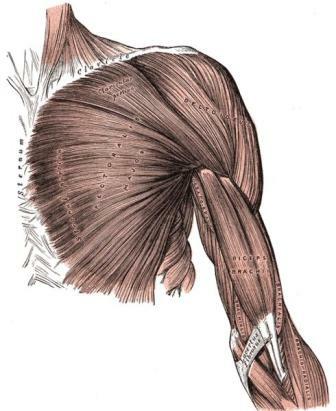 Muscle pairs allow us to move back and forth. Skeletal Muscles - These are the muscles we use to move around. They cover our skeleton and move our bones. Sometimes they are called striped muscles because they come in long dark and light bands of fibers and look striped. These muscles are voluntary because we control them directly with signals from our brains. Smooth Muscles - Smooth muscles are special muscles that don't connect to bones, but control organs within our body. These muscles work without us having to think about them. Cardiac Muscle - This is a special muscle that pumps our heart and blood through our body. Tendons connect muscles to bones. Tendons help form a connection between soft contracting muscle cells to hard bone cells. When we practice an action over and over again, we get what is called muscle memory. It allows us to become more skilled at certain activities such as sports and music. As we practice, our muscles tune themselves to become more precise in their motions and to do exactly what our brain wants them to do. So remember, practice makes perfect! When we exercise we work our muscles allowing them to become bigger and stronger. Exercise helps keep your muscles strong and flexible. If you don't use your muscles they can atrophy, or shrink and become weak. Shivering is caused by hundreds of muscles expanding and contracting to produce heat and make us warmer. It takes 17 muscles to smile and 43 muscles to frown. All the more reason to smile instead of frown! Our longest muscle is the Sartorius. It runs from the hip to the knee and helps us bend the knee and twist our leg. The strongest muscle is in our jaw and is used for chewing. The smallest muscle is in our ear and is called the stapedius. It is attached to the smallest bone in the body, the stapes.